Rand Paul Pens Glowing Koch Brothers Profile For 'TIME's 100 Most Influential — Why? Republican senator and 2016 candidate Rand Paul took a break from defending his campaign slogan of defeating "the Washington machine" to write a short review of Charles and David Koch for TIME magazine's 100 Most Influential People, released online Thursday. Paul's piece calls the brothers "idea men," and he adds that "their passion for freedom and their commitment to ideas" are under-appreciated. The piece also praises the Koch Brothers for lobbying against special-interest politics and making "important contributions to society." They have always stood for freedom, equality and opportunity. Consistent with their love of liberty, they have become prominent advocates for criminal-justice reform. The Koch brothers’ investment in freedom-loving think tanks will carry on for generations, reminding all of us that ideas and convictions ultimately trump all else. 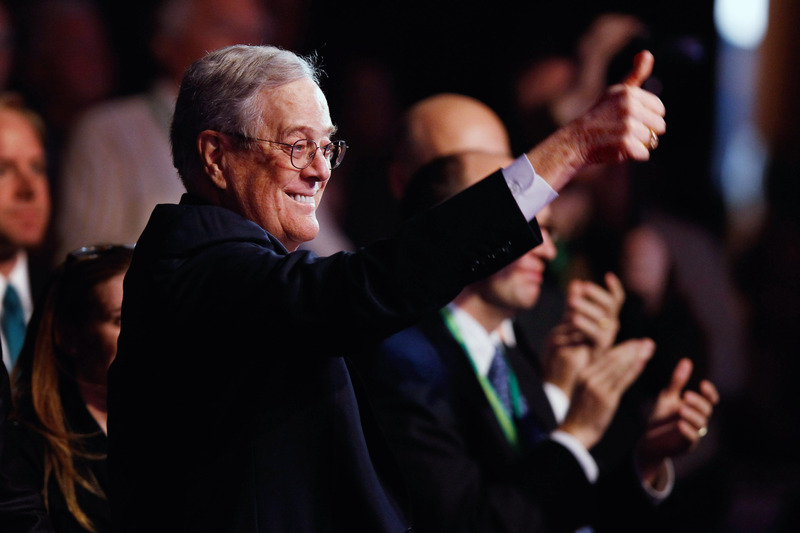 The Koch brothers were part of TIME's "Titans" list, and for good reason. The brothers' network of politically conservative donors and organizations hopes to pour $889 million into the 2016 general election, according to an announcement made in January at the winter donor retreat for the Koch brothers' primary political organization, Freedom Partners. Their money comes from Koch Industries, which is a Kansas-based company that specializes in refining, chemicals, biofuels, forest products, fertilizers, process and pollution control equipment, electronics, trading, energy, and more, according to The Hill and the Koch Industries website. Salon has already called Paul's piece "brownnosing," speculating that Paul could receive a large amount of his campaign finances from the billionaires. Team Rand could have saved a little time and just provided a mailing address for the Kochs to send a check, but appearances must be kept up, I suppose. The Paul family and the Kochs have had their ideological differences over the years, but the Kochs are far too powerful on the right for Rand to allow much friction to exist between them. The "differences" Salon is talking about came out during January's Koch brothers showcase, where Paul received the least support from donors out of all the other conservative senators present. According to Bloomberg, he didn't "chew into questions" the way Senators Marco Rubio and Ted Cruz did. He defended free trade in China and opening up Cuba and pitched an idea to block big government contractors from lobbying, which sounded like a hit to the "crony capitalism" that the Koch brothers opposed. According to Mother Jones, The Koch brothers publicly spoke out against "crony capitalism," calling out businesses who have successfully lobbied for special treatment and favors like government subsidies and regulations, even though Koch Industries benefits from those same kinds of subsidies and regulations (benefits and regulations that often come from policies supported by candidates they fund). Given the amount of money the Koch brothers plan on sending into the upcoming election and the fact that their organizations have donated sums to both of the other Republican candidates who have announced so far, it makes sense that Paul might want to get his name in the hat as many times as possible.